Heidi Heitkamp, a former Democratic senator from North Dakota (left) and Gary Cohn, President Trump’s former top economic adviser will be two of 10 new fellows at Harvard’s Institute of Politics. Gary Cohn, President Trump’s former top economic adviser, is sharply criticizing the government shutdown, as he heads to Harvard for a fellowship. Cohn will be one of 10 new fellows at the Kennedy School’s Institute of Politics, a group that hopes to model civility and the free exchange of ideas at a time when bitter political divisions have led to the longest shutdown in history. 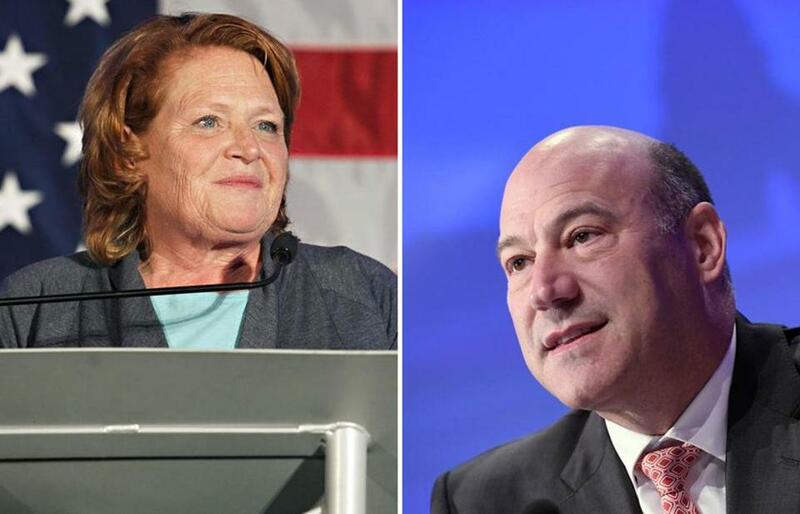 A Democrat and former president of Goldman Sachs, Cohn will co-lead a study group with Heidi Heitkamp, a Democrat who just lost her Senate seat in North Dakota. The study group, called “The Real State of the Union,” will explore fiscal, health care, and trade policy. ■ Andrew Gillum, the former Democratic mayor of Tallahassee who hoped to become Florida’s first black governor last November but lost a close race to Republican Ron DeSantis, a Trump supporter. ■ Barbara Comstock of Virginia and Carlos Curbelo of Florida, two Republican House members in swing districts who lost their seats in November, when the Democrats reclaimed the House. ■ Mitch Landrieu, a former mayor of New Orleans who gained national attention for removing four Confederate monuments and has been mentioned as a potential Democratic presidential candidate. ■ Michael Nutter, a Democrat and former mayor of Philadelphia. ■ Aisha Moodie-Mills, a former president and chief executive of the Victory Fund, which seeks to elect LGBTQ candidates. ■ Catherine Russell, a former ambassador-at-large for Global Women’s Issues under President Obama. ■ Michael Zeldin, a CNN legal analyst and former Justice Department official. Cohn’s appointment is noteworthy because the institute faced a backlash in 2017 when it named as fellows two other Trump aides: Corey Lewandowski, the president’s former campaign manager, and Sean Spicer, former White House press secretary. Kennedy School officials did not rescind the fellowships for Lewandowski and Spicer. School officials have emphasized that they want to bring fellows from across the political spectrum to Cambridge, in hopes of sparking debate and challenging students. That’s why the latest group includes Republicans and Democrats, activists and elected officials, said Mark Gearan, the institute’s director. Michael Levenson can be reached at michael.levenson@globe.com.